The most interesting aspect of nature is that its functions, which seem random and wild and inexplicable in many cases, often have a deep underlying pattern and purpose. In other words, there is an ingenious clockwork in play that, if acknowledged, transforms the mysteries of Earth’s wild nature into normal and even vital fluctuations. For example, take the vicious wildfires that have recently ravaged the American West from California inland. These seemingly destructive forces of flame and ash are part of the natural course of nature. Every couple centuries, an ecosystem must cleanse itself of brush and other excess. It’s part of a cycle—not unlike the ebb and flow of temperature trends that many people use to explain global climate change. Plus, the burning process enriches the soil of the forest to supplement growth, and a large chunk of plant species only release their seeds under conditions of extreme heat like in a wildfire. So, when people risk their lives to fight these wildfires and save neighborhoods, are they actually inhibiting the nature around them at the same time. The answer is yes—because they’re using brominated flame retardants (a mixture of harmful man-made chemicals containing bromine that have been banned in the European Union).These modern methods of fighting wildfires not only kill off a large percentage of the ecosystem’s plant and animal life, like the fire itself, but also have long-term side effects on the soil quality unlike a one-time scorch through. 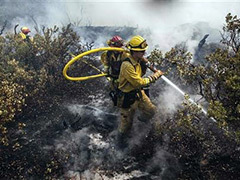 With Firemaster 550, we’re not just stopping the wildfire. We’re stopping wild things in general.It’s not bad enough that we’ve genetically modified a majority of our crops and that we’re killing off honeybees with systemic pesticides … we have to continue to do more damage with our chosen means of defense against what turns out to be a perfectly healthy natural disaster. It all really makes you question the collective footprint of humankind.I’m not saying we shouldn’t stop, or at least control, wildfires that threaten homes and communities. We just need an alternative retardant. As Gieger mentions, water usually works. Do You Need More Reasons Not to Buy Gas Guzzlers? 7 Most Dangerous Types Of Environmental Pollution - With Focus On Clean Coal Power Technology And What Is Being Done About It. Posted on November 4th under Global Ecology.